Beautiful home totally restored. Fully furnished builder model. Fully furnished Monte Vista V builders model. Beautifully decorated with views of the lake. Country club lifestyle without the mandatory membership fees. Professionally decorated single story estate home with 4 bedrooms + office, 4 full & 2 half baths & oversized 3 car garage. This estate features volume & tray ceilings, built-in living room wet bar, Saturnia marble, & hardwood floors, solid core doors & custom closets. A lovely gourmet island kitchen, 42'' light oak cabinetry, granite countertops & a charming breakfast nook. Family room entertainment center w/custom cabinetry. Custom built-ins in the office/den. Custom fabric window treatments. Freshly painted exterior. Accordion hurricane shutters; 3 zone A/C(replaced 2012); Newer washer, dryer, hot water & pool heater; Central vacuum system; Fabulous back patio offers a covered lanai w/summer kitchen & heated freeform pool & spa w/lake & golf views on an oversized fully fenced lot. STUNNING 4 BDRM/3.5 BATH TUSCAN INSPIRED TOWNHOME WITH COURTYARD IN PRESTIGIOUS HIGHLAND BEACH W/DEEDED BEACH ACCESS. HURRICANE IMPACT GLASS. SATURNIA MARBLE FLOORING. GOURMET KITCHEN W/GRANITE COUNTERS & TOP OF THE LINE STAINLESS STEEL APPLIANCES. SOME OF THE OTHER FEATURES AND UPGRADES INCLUDE: HEATED SWIMMING POOL SHARED BY THE 4 UNITS, CHICAGO BRICK PAVERS IN THE COURTYARD, RETRACTABLE AWNING, MASTER BEDROOM BALCONY, PECKING CYPRESS CEILING, CUSTOM FAUX PAINTING, CROWN MOLDING THRU OUT, PLANTATION SHUTTERS, CUSTOM CLOSETS. ONE OF A KIND FIREPLACE FROM THE 1800'S! AMAZING DEAL NO DETAIL OVERLOOKED IN THIS PROPERTY! Beautiful Spec Home ready Dec/Jan 2014 Why wait to build. Gas stub out for future summer kitchenImpact Glass whole house. Upgraded Marble 18 x18 Master Bath Package with extended marble to ceiling , upgraded Level 5 Maple wood cabinet with upgraded granite countertops and wood framed mirrors. All secondary baths have beautiful wall tile packages with coordinating designer listellos and granite countertops including under mount sinks and 8"moen spread faucets.Upgraded Level lllA Maple Shaker cabinets in Kitchen with and enhancement package including upper & lower cabinet lighting and pot and pan drawers. Stacked cabinets and profile crown molding. All Stainless Steel Kitchen Aid appliances including a 36" vented hood above cooktop, 42" built in Refrigerator and Double Oven. ABSOLUTELY STUNNING 4 BEDROOM PLUS DEN POOL HOME WITH EVERY IMAGINABLE UPGRADE. FROM THE WROUGHT IRON STAIRCASE TO THE GOURMET KITCHEN EQUIPPED WITH STAINLESS STEEL APPLIANCES AND DESIGNER GRANITE. THIS OPEN FLOOR PLAN LEADS INTO ONE OF THE MOST PHENOMENAL BACKYARDS YOU HAVE EVER SEEN. THE RESORT-STYLE BEACHFRONT ENTRY POOL HAS A 6 PERSON JACUZZI AND A SALT WATER SYSTEM WITH A DIGITAL DISPLAY THAT PROGRAMS THE POOL AT THE PALM OF YOUR HAND. THE TRAVERTINE MARBLE DECK IS EXPANSIVE AND THE COVERED PATIO IS EQUIPPED WITH REMOTE CONTROLLED SCREEN SHADES. THIS HOME IS ON ONE OF THE LARGEST LOTS IN THE COMMUNITY AND HAS PLENTY OF ROOM TO ROAM.THE HOUSE HAS HURRICANE IMPACT WINDOWS AS WELL AS 3M TINT ON ALL THE WINDOWS TO KEEP OUT MOST OF THE UV RAYS. SEE SUPPLEMENT FOR COMPLETE REMARKS. Updated light and bright Keenland model. The kitchen has been remodeled with a modern style and has natural gas cooktop. The flooring is redone in a espresso wood. Master suite, guest bedroom and office are located on the first floor. Second floor has 2 bedrooms and open loft. FULLY FURNISHED Madrid Model,Corner lot. Upgraded kitchen:granite countertops & backsplash, double oven,built-in pantry w/ shelves. Custom light fixtures & fans throughout. 18'' tile on diagonal.Custom office w/ wood tile. French doors to outside. Shows like a model. Must see! MAJOR PRICE REDUCTION! Not a short sale, Not a foreclosure, estate sale, quick settlement, as is, perfect for end-user looking to live in prime South Florida location, lots of equity potential . The best value in the Seasons community.......''Gorgeous lakefront lot. Triple split floor plan. Huge walk in closet in master. Covered & Screened patio. Fenced in pool & patio area. 2 newer A/C units. 2 newer water heaters. Vaulted ceilings. Maintenance fee also includes ATT U-verse TV and internet. Best deal in the Seasons! ***MODEL PERFECT*** Fabulous 4 Bedroom home on premium interior canal lot. This meticulously maintained home has it all. Kitchen with shaker style cabinets, SS microwave, SS double GE Profile ovens, SS GE Profile natural gas cooktop, SS Meile quiet dishwasher, SS LG French Door Refrigerator, granite counters and SS Mosaic backsplash with under cabinet lighting.Kitchens and baths with roll-out shelves. Service Bar with Wine Cooler. Baths feature a combination of stone, glass, ceramic and marble tiles. Custom Closets,designer paddle fans and chandeliers throughout. Hardwood floors throughout. Ceiling heights range 10' to 12'8'' with tray ceilings and extensive crown molding. All windows feature Plantation Shutters. Stero sound in 5 rooms including porch. WOW! This beautiful COMPLETELY REMODELED Roma model(triple split floorplan) is in impeccable condition, located on a large lot, The freshly painted interior is loaded w/extras such as granite kitchen counters w/island(breakfast area) w/full back splash, upgraded 42'' wood glazed cabinetry, double convection ovens, water filtration system, under cabinet lighting, custom Hunter Douglas window treatments. Master bathroom contains Roman tub plus separate make up area w/granite counters, and frameless shower enclosure. Exterior features custom free form screened gas heated salt water pool w/waterfall, fully fenced backyard, motorized sunshade, accordion hurricane shutters, brand new 20KW whole house generator, and tankless water heater. This home has it all, a true 4/3 w/tons of square footage! BEST VALUE - LOWEST PRICE HOME IN VALENCIA - MOVE IN CONDITION FABULOUS INDIAN MODEL ON OVERSIZED PREMIUM LOT. SHORT WALK TO CLUBHOUSE. PRIVATE BACK YARD WITH LUSH LANDSCAPED BUFFER. THIS HOME FEATURES HIGH VOLUME CEILINGS WITH TRANSOM WINDOWS CREATING A VERY BRIGHT AND AIRY HOME. DRAMATIC IMPACT ENTRY DOOR AND FOYER WITH MARBLE INLAYS. CUSTOM HARDWOOD FLOORING, CROWN MOLDINGS, UPGRADED KITCHEN WITH EXTERIOR VENTED MICRO/HOOD, CUSTOM BASEBOARD MOLDING, FULL TILE SHOWERS, ACCORDION HURRICANE SHUTTERS, HUNTER DOUGLAS BLINDS, EXTENDED PAVED PATIO AND NUMEROUS OTHER UPGRADES ADDED AFTER PURCHASE FROM BUILDER. Located at the Fabulous Seagate Country Club at The Hamlet where membership is always optional but very desirable.Beautiful lake front home, newer roof, full house generator. Located close to Delray Beach and all offerings. Must See. Gorgeous 2 Bedroom, 2 Bath, 2 Car Garage, POOL Home in the Gated Community of Valencia Pointe! This Amazing Home Features a Large Living/Dining Room, a Family Room that is Open to the Eat-In Kitchen with Recessed Lighting, Closet Pantry, Breakfast Bar, and Tons of Counter Space! The Master Bedroom is HUGE and the On-Suite Master Bath includes Double Vanity, Garden Tub and a Separate Shower! The Secondary Bedroom is also a Great Size and right next to the Full Guest Bath! Let's Not Forget about the Backyard...What an Oasis! Beautifully Landscaped with a Breath-Taking Pool! This is One Home That You Have To See!!!!! Don't Wait! Go See It Today! End unit in West building. Direct intracostal view. Updated kitchen, tile floors. Concrete restoration and pool areas are currently being completed. Coronado is a resort community with private beach club, tennis courts, boat docks, fitness room. Two pools, one on the intracostal and one on the ocean. Concierge building with 24 hour guard. What a stunning home!!!!! Walk thru the double door entry into volume ceilings and sparkling floor revealing an absolutely spectacular floor plan. Pristine kitchen with granite and custom cabinetry. Extremely spacious master suite with double vanity bath and his and her closets. All tile throughout living areas and wood and laminate wood in bedrooms. Laundry room is equipped with cabinets, laundry sink and storage closet. This home features a cabana bath for your future pool and an impressive enclosed lanai with a/c. All windows facing east or west are tinted. Beautiful new roof, July 2014. A/C unit was replaced in 2008 and water heater replaced in 2010. Located in very desirable neighborhood with "A" rated schools. Not zero Lot. Oversized corner lot, 2/2 with bonus office/den(with closet). Updated kitchen with Granite countertops and wood cabinets. Updated bathrooms. Split bedroom plan. Tile throughout the entire house. Accordian shutters throughout. Newer roof 2006. Oversized 1 car garage. True resort living! Fantastic views overlooking the pool area, marina and wide Intracoastal water views. 3 bedrooms and 2 full baths. Hurricane impact windows, large balcony. The open kitchen has stainless range and microwave, European cabinets with matching refrigerator and dishwasher and granite countertops. The Moorings, the most desirable building on the waterfront offers luxury amenities. Valet parking, an upscale fitness center with men's and women's saunas, business center, a beautiful clubhouse with pool table, large flat screen TV, bar & lounge area along with outside patio area equipped with table and chairs looking out onto the marina and waterways. Dock space available through Marina. 2 heated pools and hot-tub. 2 pets allowed up to 35 lbs. each. Immaculate 2 story 4/3.5 lake view home with 3 car garage. Accordion shutters throughout. 2 master suites one on each floor. Real Hardwood flooring. Spa Shower in Master bedroom. Swim spa pool. Wet Bar. Established community w/ resort style clubhouse. Open feel with soaring ceilings. Tile in main areas and baths. separate kitchen & dining area. Kitchen has granite counters & back splash w/ 42'' cab., island & breakfast bar. Screened patio w/ lake view.Exterior accordian shutters. Master bedroom has his & her walk in closets. Master bath has dual vanity, separate tub & shower w/ corner jetted tub. Built-in desk in front bedroom. New water heater in 2010 & new AC in 2008. Good curb appeal w/ side load garage. Beautiful resort like community on the Intracoastal. Magnificent amenities including Pool and large modern clubhouse, 24hr gym and basketball court. Close to shopping, transportation and within 15 minutes of palm beach airport. Don't hesitate or it will be too late! BEAUTIFULLY DECORATED HOME ON A VERY PRIVATE CORNER LOT. THIS HOME HAS A ''MINI SUITE'' - ONE OF THE GUEST BEDROOMS HAS A FULL BATHROOM IN THE ROOM AND A WALK IN CLOSET. THE FLOORING IS TILE IN THE LIVING AREA AND HIGH END LAMINATE IN THE BEDROOMS. OTHER UPGRADES INCLUDE AN EXPANDED PATIO, A TUMBLE MARBLE BACK SPLASH AND PULLOUT DRAWERS IN THE CABINETS IN THE KITCHEN, A NEW A/C (2012), AND ACCORDIAN SHUTTERS. 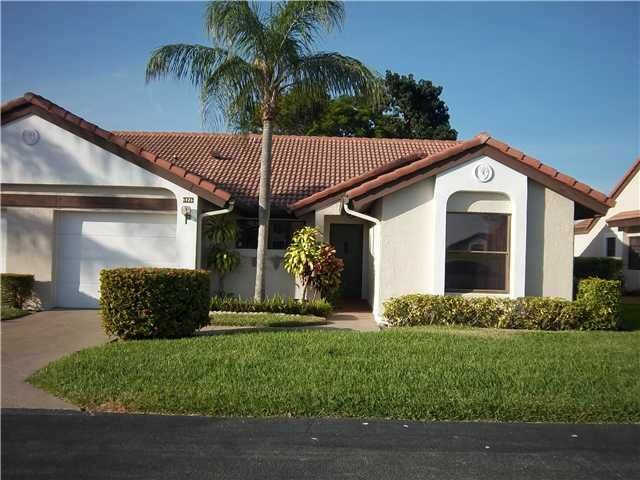 VENETIAN ISLES IS ONE OF THE MOST ACTIVE AND DESIRED COMMUNITIES IN BOYNTON BEACH. OUR REMODELED 26,000 SQ. FT. CLUBHOUSE IS THE CENTER OF THE ACTIVITIES IN OUR COMMUNITY. FACILITIES INCLUDE TWO POOLS, A LARGE SHOW/PARTY ROOM, CARD ROOMS, EXERCISE ROOM, LIBRARY/COMPUTER ROOM, BILLIARDS, ARTS & CRAFTS ROOM, ETC. PRIVATE AND SPACIOUS TOWNHOUSE IN THE GATED WATERFRONT COMMUNITY OF REGENCY HIGHLANDS WITH OCEAN ACCESS, TROPICAL VIEW, 2 POOLS (1 POOL DIRECTLY ON THE INTRACOSTAL),GRILLS,BEACHFRONT TIKI TABLES, GARAGE PARKING,PLUS BOAT DOCKAGE. Easy Close! Beautifully updated 3 bedroom 2 bath with 2 car garage. Situated in desirable residential gated community featuring clubhouse and pool. Interior corner lot with nice yard. Kitchen has granite countertops and back splash with stainless steel appliances still under warranty. Newly installed flooring includes 20 inch porcelain tile on the diagonal in the main living area, kitchen and second bathroom. Bedrooms have dark laminate. Home has many tasteful upgrades and ample closet space. New AC 2012. New accordion hurricane shutters. Security System. This turn key home is private and convenient. FLEXIBLE FLOOR PLAN COULD CONVERT INTO 4BR. LIVING ROOM WITH CONVERSATION PIT & WET BAR, LARGE FAMILY ROOM & AN ENORMOUS COVERED & SCREENED PATIO. ALL FACING A BIG BACK YARD & NO REAR NEIGHBORS. PLENTY OF ROOM FOR A POOL ACCORDIAN HURRICANE SHUTTERS. FRESHLY PAINTED INTERIOR. NEW A/C 2009. ROOF REPLACED IN 2002. NEW WASHER & DRYER, NEW DISHWASHER, NEWER REFRIGERATOR, LOTS OF STORAGE INCL. WALK-INS CLOSETS; ATTIC SPACE; PANTRY. SCREENED AREA WITH DOUBLE DOOR ENTRY. PHEASANT WALK IS A LOVELY COMMUNITY IN CENTRAL BOCA WITH A FIRE STATION WITHIN ITS BOUNDARIES. A GREAT HOME IN A GREAT COMMUNITY AND GREAT LOCATION! Attention Tennis players... Steps to your community courts. Looks like your own private court.Highly sought after 2 suite home in private and secure association. NEW -stainless refrig.,range,dishwasher,microwave. Many upgrades include accordion hurricane shutters,large kitchen great room -perfect for entertaining,new central AC system with upgraded energy efficient thermostat. This is in move in condition and clean clean clean !Large master bath with double shower,huge soaking tub and closets galore. Master bedroom has view of water. FRESHLY PAINTED INTERIOR. Large 3/2 split bedroom plan. Kitchen cabinets refaced. Bathroom cabinets refaced. Custom closets. Open patio with awning. No rear neighbors. Newer A/C.Community features a 72,000 square foot clubhouse with a theater, pool, and cafe. There are 10 hard tru tennis courts and a tennis pro. 3 BEDROOM 2.5 BATH LUXURY TOWNHOUSE BUILT IN 2007. COMPLETELY UPDATED WITH GRANITE COUNTERTOPS,WOOD CABINETS IN KITCHEN,BEAUTIFUL TILE & WOOD FLOORS. HIGH IMPACT WINDOWS THROUGHOUT. CLOSE TO DELRAY BEACH RESTAURANTS AND SHOPS. THIS TERRIFIC 2 BEDROOM PLUS DEN HOME FEATURES UPGRADES THROUGHOUT. MASTER BEDROOM HAS CALIFORNIA CLOSETS, PLANTATION SHUTTERS AND FURNITURE BUILT-INS. TILE ON 18'' DIAGONAL IN LIVING AREAS, GARAGE HAS SPECIAL FLOORING AND LOTS OF STORAGE CABINETS. HURRICANE ACCORDION SHUTTERS ON WINDOWS.. 3RD BEDROOM IS DEN WITHOUT CLOSET. COMMUNITY W/A CLUBHOUSE OF OVER 22,000 SQ FT, A TENNIS COMPLEX OF 6 TENNIS COURTS, HEATED RESORT-SIZE SWIMMING POOL AND SPA. ALSO HAS AN ACTIVITY DIRECTOR. INFORMATION DEEMED RELIABLE AND SUBJECT TO CHANGES, OMISSIONS & ERRORS WITHOUT NOTICE. ALL MEASUREMENTS ARE APPROXIMATE. INSTANT EQUITY APPRAISED FOR $260,000 LESS THAN 2 WEEKS AGO***UPGRADED 3 BEDROOM 2 BATH HOME*** BRAND NEW KITCHEN with Granite Countertops and Stainless Steel Appliances. This home is move in ready. BRAND NEW ROOF. Tile floors throughout. Open/Spacious floor plan. Nicely landscaped front and backyards. Freshly painted inside and out. Large driveway, oversized garage. Located close to shopping, schools, dining, etc. One story 3/2 plus bonus room/den/florida room. Split bedroom plan. Quiet neighborhood, Oversize Premium Lot with Fruit and Avocado Trees, Newer Roof, Tile throughout living area. Newer carpet, walk-in closets, fully fenced backyard. Close to shops, restaurants. Hard to Find in Boynton beach!Newly Listed!ALL AGES Madison lakes gated Community.Sparkling Refurbished Home One Level . Ideal family neighborhood with low HOA, walk to schools, and houses of worship. Easy access to major highways. New Top of the line Stainless Steel Kitchen appliances 2 car garage. Light and bright with wood floors in all bedrooms, and Neutral DÃ©cor thru-out. Tiled Screened in Patio. Community Pool, Spacious and Freshly Painted , like new! Ready to move right in! All for $225,000..SOLD ''AS IS'' There is nothing needed, move right in! Light and bright corner unit with amazing lake views. Highly upgraded kitchen. Bamboo flooring on the staircase and the entire 2nd floor. Impact glass throughout. Best unit on the market in Briella! Best value in building for a two bedroom condo, split floor plan in one of Delray's best locations, just one block off of Atlantic Ave & 3 blocks from the beach. Tiled throughout, freshly painted. Half bath has been converted into a laundry room. The Delray Summit sits on one acre of beautifully landscaped property right on the island abutting the intracoastal waterway. The community welcomes all age groups and allows rentals with no waiting period. All major renovations have been done in the last few years. This includes new main building and carport roof, concrete restoration, exterior painting and interior hallway carpeting. The unit can be sold turnkey if there is interest. Enjoy the best of Delray in this most desirable location! Beautifully maintained Carnation 2 Villa in active 55+ community. Two Bedrooms, 2 Baths w/Convertible Den and 2-Car Garage. Tasteful and Elegant, Faux Finished Wall Treatments, with very little Wallpaper (Borders only in MBR and Guest Room). Plantation Shutters in Kitchen and Den, Accordion Hurricane Shutters, Builder's upgraded kitchen cabinets, Newer A/C (2011). Kitchen and dining room fixtures may not convey. Active Community with Baby Boomers Club, Men's/Ladies Clubs, Bridge, Tennis, Movies, and much more! 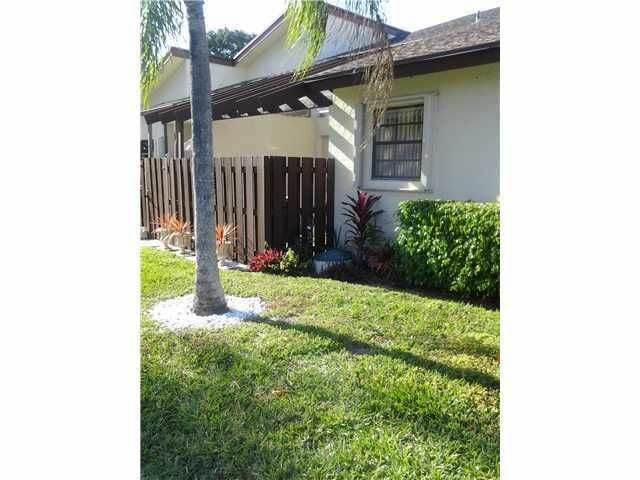 Close to Delray Marketplace, all highways and Beaches. Enjoy the Florida lifestyle in the Lexington Club. Spacious turnkey condo in desirable intracoastal community. Best bargain by the water! Lovely views of pond, fountain, lagoon and intracoastal from your screened porch. Open floor plan, large rooms and all furnished, just bring your suitcase! Decor is neutral. Living in Half Moon Bay is ''all age'' and like being on vacation year round, lovely grounds, pools, clubhouse, even it's own beach! Large master suite with sitting area and bath. Don't miss this fabulous opportunity to live at the intracoastal without spending a fortune. You can still get in before season is over or enjoy life in paradise all year round. CHARMING BEACH condo.LOCATION,LOCATION, Remolded 1/1 with tile floors.1/2 blk to BEACH.Walk to Atlantic Ave.Only 8 units in building 1st floor.All ages,small pets and can be rented.Plantation shutters. Low maintance $1,400 semi-annually. Very nice large 3/1.5 plus 1/1 mother-in-law suite. Beautiful big remodeled kitchen, dining room,living room and family room plus great backyard & patio area w/circular paver driveway. MANDATORY MEMBERSHIP REQUIRED. Light & Bright home situated on over 1/4 lot. The lot is completely fenced and is perfect for dogs. The back patio is screened and covered. The entire house is tiled. The kitchen has corian countertops and newer stainless steel appliances. This great room layout also has a split bedroom plan with 3rd room currently used as an office/den(no closet). The master bedroom is very spacious and has two walk in closets. The master bathroom has a Jacuzzi tub and separate shower, and 2 sinks. A/C was replaced in 2013. Newer front load washer and dryer. This home is being sold furnished. NOT A SHORT SALE *** NOT A FORECLOSURE *** READY TO MOVE-IN *** READY TO CLOSE. NEWLY RENOVATED TRUE 4/2 ON CANAL WITH BEAUTIFUL VIEWS, NO REAR NEIGHBORS, HUGE PIE SHAPE LOT NEWER ROOF, GORGEOUS NEWER KITCHEN WITH WOOD CABINETS, STAINLESS STEEL APPLIANCES, NEWER BATHROOMS, NEWER TILE FLOORING. CENTRAL A/C & ACCORDIAN SHUTTERS, SPLIT BEDROOM PLAN. A MUST SEE. SHOW IT TODAY BEFORE IT'S TOO LATE. Plenty of wildlife that can frequently be seen: marsh hawks, egrets, great white egrets, blue heron, great blue herons, coots, turtles, etc.. Also, you can fish in the canal. There are bass and bluegill. 2/2 with spacious enclosed A/C Florida room. Newer tile floor throughout. Kitchen and bathrooms have been updated with newer appliances and Corian countertops. Accordion hurricane shutters. Jacuzzi tub in 2nd bathroom. Walk in closet in master. 2/2 end unit. Updated kitchen with Granite countertops. Pergo flooring in both bedrooms. Partially furnished. Unit can be rented right away. SE facing waterfront Penthouse unit in the building with the best view in the development. Directly on the canal. Owner will consider all reasonable offers. GREAT TWO BEDROOM VILLA WITH A BEAUTIFUL LAKE VIEW. TILE IN THE LIVING AREAS AND CARPET IN THE BEDROOMS. THE COMMUNITY OFFERS THREE POOLS, A GREAT CLUBHOUSE. THERE IS NO MANDATORY MEMBERSHIP FEE! ONE PET / SMALL DOG ALLOWED UNDER 20 POUNDS. GREAT AREA TO LIVE, CLOSE TO THE BEACH, CLOSE TO WELLINGTON, CLOSE TO DELRAY BEACH AND BOCA RATON! LOTS OF SHOPPING AND RESTAURANTS! NO RENTAL RESTRICTIONS CAN BE RENTED IMMEDIATELY. Fully furnished first floor corner unit. Kitchen cabinets have just been refaced Front and back screened and covered patios. Waterview from the back patio. Newer A/C and Hot Water Heater. Ideal location close to 95, beaches, shopping & golf. Move-in ready, upgraded & tastefully furnished condo. Spacious split-bedroom plan with all carpeting removed, new flooring, newer appliances. Large eat-in kitchen, with laundry in suite. Large living/dining area with separate den for office or 3rd bedroom. Well managed, all ages building, beautiful pool area. Large, screened-in balcony overlooks golf course. All furnishings included. Includes 2 lovely sleigh beds, 2 flat-screen TV's, 2 leather double-recliners, persian rug, Tommy Bahama style tables & dressers, roll-top desk & more! All kitchen equipment included. Just bring your suntan lotion and move in! 3 bedroom end unit 1 story villa with lakeview from screened and covered patio. Remodeled kitchen with Granite countertops, and newer SS appliances. Tile throughout the living area. Laminate in the bedrooms. Split bedroom plan. Newer Washer, and Dryer. Newer paint job. A must see will sell fast! Beautiful Lakeview villa-wood cabinets in kitchen w/corian counters. Screened patio. Three BR/den has pocket doors for privacy. Murphy bed w/built in furniture. New roof. Perfect place to call home. Membership equity required. In addition seller will give buyer $7,500 toward membership. 3rd floor direct lake view condo with glass enclosed Florida room and covered parking spot. The condo has been updated with granite countertops, newer appliances, and newer A/C. Furniture Negotiable. BEST DEAL ON THE MARKET IN HUNTINGTON POINTE! EQUITY MEMBERSHIP REQUIRED. Beautiful open floor plan, Stone like tile throughout . Neutral decor, accordian shutters. 3 bedroom Alhambra model . Master also has marvelous tray ceilings and a Luxurious Master bath with separate tub & shower including his/her vanities and sinks. Eat in kitchen with corian counters and 42'' wood cabinets. Kitchen opens to large family room with sliders to screened back patio. Split bedroom plan for privacy. Front bedroom has lovely bay window and with private 2nd bath just outside ...could be a second master suite. Double front doors open into stunning center hall. The Living room is opposite a beautiful, large dining room allowing for family and entertaining. High ceilings throughout along with archways create character and charm. Spacious 1st floor 2 bed, 2 bath plus den. Tile throughout. Open floor plan. Gorgeous lake view. Quiet well kept complex with full amenities-clubhouse has been recently renovated with a theater, cafe, indoor pool, tennis courts, etc. Great property! 2 BEDROOM 2 BATH CONDO IN GATED COMMUNITY. ALL AGES WELCOME! NEWER CARPET REMODELED BATHROOMS. NEWER KITCHEN. STORM SHUTTERS, CLOSE TO ATLANTIC AVE, BEACH, RESTAURANTS, SHOPS. NO RENTALS/NO LEASES. DON'T MISS THIS BEAUTIFUL, FULLY UPDATED MINT CONDITION HOME! THE PRIDE OF OWNERSHIP SHOWS FROM THE MINUTE YOU PULL INTO THE DRIVEWAY! THIS HOME IS TILED THROUGHOUT!AIR CONDITIONED FLORIDA ROOM MAKES IT 1200 sq. ft. MOST EVERYTHING IS BRAND NEW! A/C, WATER HEATER, WASHER/DRYER AND GUTTERS REPLACED IN 2012! STAINLESS refrigerator AND STOVE REPLACED IN 2011. KITCHEN CABINETS WERE UPDATED IN 2010. BOTH BATHROOMS TILED, REMODELED AND UPDATED 2010!! ROOF REPLACED IN 2006!! THIS HOME ALSO HAS ACCORDION SHUTTERS! NICELY LANDSCAPED! COUNTRY MANORS CLUBHOUSE HAS MANY ACTIVITIES AND A LOW HOA FEE. YOU MUST SEE THIS HOME AS THERE NO OTHERS QUITE LIKE THIS ONE! 1 Bd plus + LOFT Guest Room OR Office. 2 full bathrooms. New Kitchen, New Stainless Appliances, New Ceramic Tile throughout, NEW A/C. Not a short sale or reo. Animals for emotional support/service animals request permission from board(deposit) Washer & Dryer inside house. BRAND NEW AIR CONDITIONER. MEASUREMENTS NOT GUARANTEED. 1 Person 55+, kids over 15 years of age. Hurricane Shutters in Front of Unit. 1 Stall Shower plus 1 bathtub shower in master bedroom. BBQ. Clubhouse. THIS IS A FANNIE MAE HOMEPATH PROPERTY.PURCHASE THIS PROPERTY FOR AS LITTLE AS 3% DOWN. THIS PROPERTY IS APPROVED FOR HOMEPATH RENOVATION MORTGAGE FINANCING AND HOMEPATH MORTGAGE FINANCING. GREAT 2/2 UNIT IN A 55+ COMMUNITY REHABBED AND READY TO MOVE IN WITH NEW CARPET IN THE BEDROOMS AND LIVING AREA, WOOD LAMINATE FLOORING IN THE KITCHEN, PRIVATE BATHROOMS IN BOTH BEDROOMS, A SCREENED PATIO, AND CARPORT WITH LAUNDRY ROOM. THIS UNIT IS LOCATED NEXT TO THE POOL! NO LEASING ALLOWED FIRST YEAR OF OWNERSHIP. Light and bright fully furnished 1st floor condo with golf and lake views. The condo has crown molding and tile throughout the living area and 2nd bedroom. Large bedrooms each one has a King size bed. Walk in closets in both bedrooms. Accordian hurricane shutters. Must see! Seller is including her car 1994 Grand Marquis with 48,000 miles with an accepted offer. 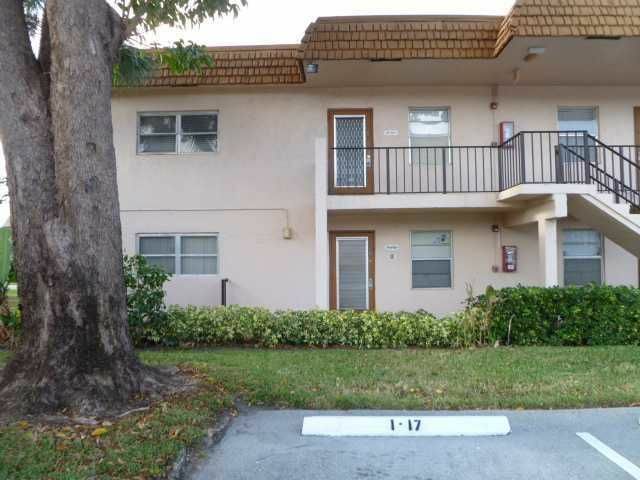 1st floor 2/2 end unit condo + Florida room w/updated A/C & hot water heater. Tiled foyer & eat in kitchen.Laundry on 1st floor.Active 55+ comm.w/clubhouse,pool & trolley transportation.Walk to shops-drive 15 mins to beach + trendy downtown Delray. CASH OFFERS ONLY. 1 BEDROOM CONDO WITH BEAUTIFUL WATER VIEW IN THE HEART OF WEST PALM BEACH. ON BEAR LAKES GOLF COURSE. INVESTORS DREAM, GREAT FOR END USERS TOO! ALL AMENITIES, GUARD GATED. MINUTES TO CITY PLACE, AIRPORT.